What it is: a small, portable, live-catch cage trap which uses a call-bird and / or bait to lure other birds into the cage. Legality: legal for use by ‘authorised persons’ under general licence (e.g. 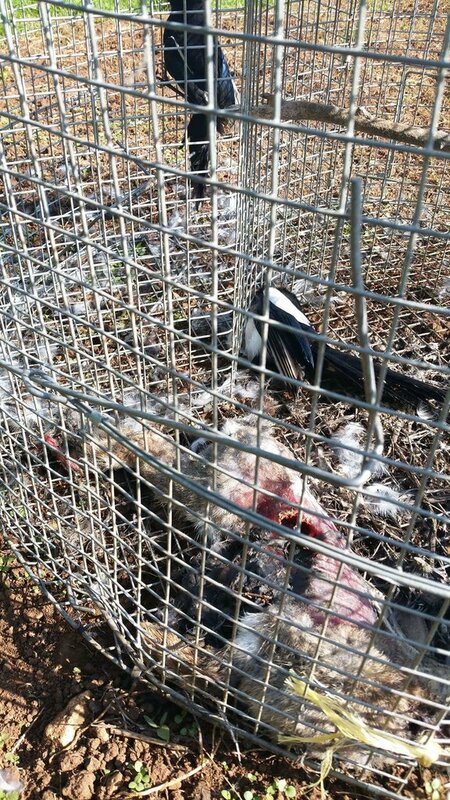 landowners, those with permission from the landowner) in trapping corvid ‘pest species’ (magpies, crows…). Only certain species can be used as call-birds / decoys: crows, magpies, rooks, jackdaws plus ring-necked and monk parakeets. There is a legal requirement to check on traps at least once every 24hrs; a check must be thorough enough to ensure that the call-bird is not sickly and to see if other birds have been trapped. If a decoy is being used they need to be supplied with water and shelter. Non-target birds, such as birds of prey, found trapped must be released unharmed. Who uses them: farmers, gamekeepers, general public (we have seen some in the countryside in people’s gardens). Where they are found: traps may be found along hedgelines, in corners of fields or gardens or raised up, sometimes just to avoid gambles or possibly placed on bales or solid objects (raising cages with call-birds in may make local territorial breeding pairs more frustrated and more likely to be trapped when arguing with them). Target animals: corvids or parakeets. 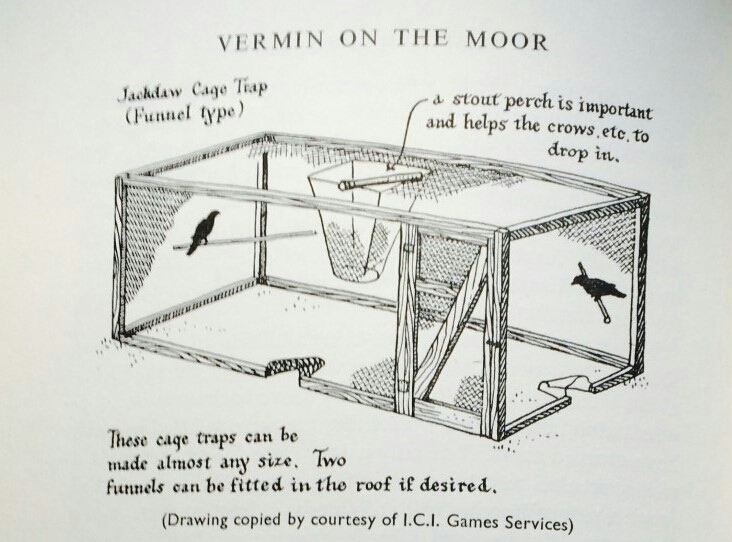 How they work: Larsen traps were designed in the 1950s by a Danish gamekeeper and can be used year-round to catch corvid ‘pest species’ though gamekeepers may use them mainly during spring and early summer when gamebirds are more vulnerable. They were deployed more regularly by gamekeepers from 1990 onwards in the UK. They are normally made of wood and wire (like chicken fence) or just wire and consist of several compartments; ‘catching compartments’ will have spring doors on top of them often held open by some kind of perch. When a bird lands on this perch, it will drop, the bird falling into the compartment and the door flipping up and closing. 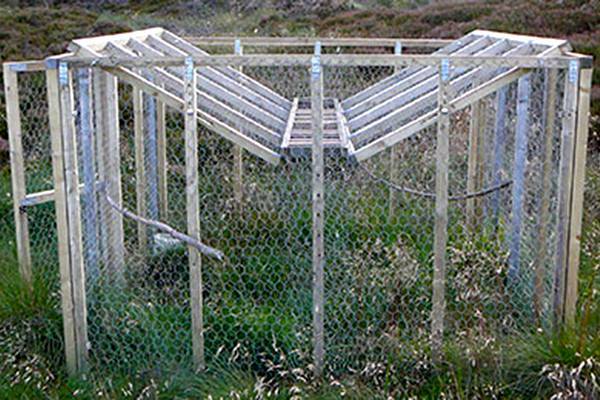 Traps may be found near to nesting sites of breeding pairs as they are more of a risk to gamebirds than flock-living birds who have no breeding sites and much larger territories (they shouldn’t be used near rookeries as ravens may be caught; sometimes they are used near flocks in an attempt to trap and kill larger numbers). As males feed females while they incubate eggs, females need to leave the nest if the males do not return to do so. Additionally they defend their territory as pairs, making it possible that both birds in the pair will be caught (however they may also learn to be cage-shy if they see others trapped and killed). Chicks and eggs may then be abandoned. 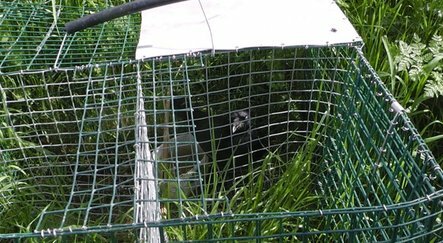 Traps can be used with bait alone, though target birds may be more wary of the cage without a call-bird. Often eggs are used as bait (sometimes fake eggs, sometimes golf balls) or the innards of other animals or carrion. Don’t assume a cage is not in use because it does not have a call-bird inside. Call-birds should be removed when the trap is not in use and it is suggested that traps are turned upside down to avoid trapping other birds or animals during this time. A newer design of Larsen trap has side entrances. To minimise the risk of catching non-target birds and other animals only eggs or bread can legally be used as bait, no carrion. 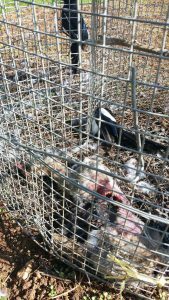 Trapped birds are supposed to be killed humanely when the trap is checked. Sometimes the original decoy bird is killed with the newly trapped bird replacing them. The GWCT trust suggest smashing the bird’s head against a solid surface then breaking its neck to be sure before disposing of the bodies appropriately… Several carcasses of birds killed in this way were found next to a Larsen trap used by Hartpury College in 2016 where they were apparently too lazy to dispose of the bodies correctly. 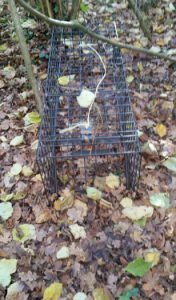 These traps can also catch non-target species, as can be seen in this photo taken by Cirencester Illegal Hunt Watch where a dead kestrel was found in a trap in September 2016. How to help: If you find sickly birds or species not in the list of birds legally ‘trappable’ our advice is to photograph them or film them in situ, ensuring that the location of the trap, whether water / shelter is provided and any injuries / symptoms are obvious and then phone for legal advice or wildlife rescue help if necessary. If possible, remove the bird/s and take them to a wildlife expert / hospital – call-birds often have their wings clipped and cannot fly. Traps may have side access doors or birds can be extracted via the ‘trapdoors’ in the roof. If an offence has been committed the police can be informed (we advise talking to Outpaced about this as they can contact wildlife officers more easily) and the trap should be turned upside down and removed to ensure no other birds can be illegally trapped – it’s unlikely that police will come out to the scene unless a bird of prey has been captured (in which case call police and wildlife rescuers immediately). What it is: like Larsen traps, they are multi-catch cage traps, they just use ‘funnels’ instead of ‘trap doors’. Legality: legal, if used by landowner or with landowner’s permission and to trap permitted birds. Again, they must be checked at least once every 24 hours and dead / sickly birds removed immediately. Non-target catches such as buzzards should be released unharmed. Decoy birds should be provided with water, shelter and a perch which doesn’t cause discomfort to their feet. Who uses them: landowners, gamekeepers… we don’t do find so many within the UK but we thought worth mentioning in case someone finds one and needs to identify it. Where they are found: they are apparently popular on hills for carrion and hooded crow ‘control’ (roof-funnel style). 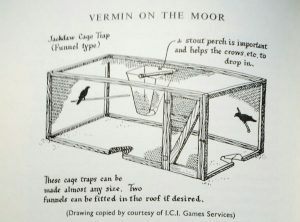 Target animals: same animals as Larsen traps. How they work: a wire ‘funnel’ will be wide enough at the top (or side) for a bird to fit into before gradually tapering to become more narrow. Especially with funnels in the top of cages, birds will be unable to get back out as they will have to spread their wings to fly, making them too big to fit through the narrow end of the funnel. How to help: as with Larsen traps look for sickly or non-authorised species as well as water and shelter. Phone for advice / to report offences, film / photograph any necessary evidence (including location) if offences have been committed and / or remove the bird/s to take to a wildlife hospital. Most cages will have access doors – these may be locked shut however (or open when not in use – they should be locked open or removed completely when cage not in use). What it is: another type of multi-catch cage, again one that we rarely see in the fields. Legality: legal if the operator is an ‘authorised person’, the welfare requirements of any decoy bird are met and they are not capturing unauthorised species. Where they are found: as with Larsen and funnel cages, in fields, by hedgerows, etc. How they work: the cage design remains similar, but two sides of the roof slope down to meet in the middle of the cage. The cage can be referred to as a ‘ladder’ or ‘letterbox’ cage – this is because the middle of the cage, where the slopes meet, is a ladder-like structure with rungs running along it, creating gaps into which birds can drop. Again, it will be harder for birds to then get back out due to having to spread their wings to fly up. Normally the gaps at the ends are blocked up as some species, like jackdaws, are good at climbing wire using their beaks and talons. 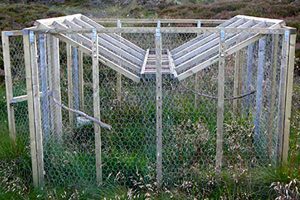 Many gamekeepers believe the only advantage of these traps over other designs is that they won’t catch gamebirds accidentally, unlike the styles which use funnels. How to help: as above. What it is: a normal cage design, rectangular, metal. Legality: depends on the target animal – badgers can currently only be trapped under licence to be shot during the badger culls or trapped for vaccination. 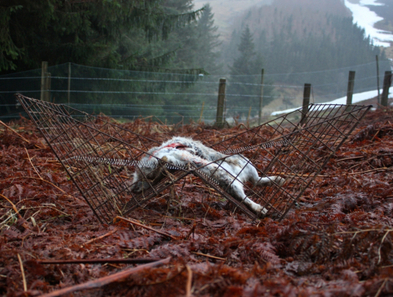 Foxes and rabbits, on the other hand can be trapped and killed without licence. Where they are found: wherever anyone wishes to trap an animal. In fields, hedgerows, under trees, by pheasant pens. Target animals: different sizes of cages are used to catch squirrels, rabbits, foxes and so on. Pictured above is a badger cage. How they work: some traps will have a pressure plate towards the rear of the trap which, when stepped on, releases the door to close behind the animal. Others may have different mechanisms – during the badger culls we sometimes see a rock with bait placed underneath and a string connecting the rock to the door, sometimes the string is tied in a triangle formation – both times set in order to release the door when moved. The door can only be opened one way and often has a mechanism which prevents the door from simply being pushed open from outside. How to help: is there an animal in the cage? What species is it? If illegally caught or they look like they’re in distress, you may wish to call the police / RSPCA and let them know. However, an animal in distress may need releasing a lot quicker than it can take police / RSPCA to arrive and therefore it may be a better idea to film in detail using a phone or camera including information as to the location of the trap and surrounding landmarks / GPS coordinates or similar plus signs of distress, etc. in the animal. If they seem injured, they should be given proper medical attention (and animals like badgers can be very difficult and dangerous to handle… so talk to a local wildlife rescue – such as Vale Wildlife Hospital in our area – for advice. Otherwise they should be releasable again. If there is no animal in the cage, it may still be set illegally. Cages like this are usually relatively easy to ‘trip’ (unless they are tied open whilst animals get used to them, going in and out without being caught in order to feel safe around this new thing in their environment). To trip them you can normally push a stick through a hole in the side or top and put some pressure on the plate or if there’s a rock or string formation (like used in badger traps in the culls and vaccination) you can just give the string a little tug and the doors should close shut. Obviously these cages can then be re-set by the owner, but they’ll be ‘made safe’ for a short while and may give you enough time to find out about the legality of the trap… In Gloucestershire during the badger culls the police came up with a compromise that the NFU reluctantly agreed with regarding ‘cage crime’. In order to try and reduce the numbers of cages being damaged or stolen, police stated that they would not be seeking criminal charges for someone tripping and closing cages. The NFU agreed to this compromise as it would save them money and mean that those cages could still be used again. At all times if you need advice on what to do about a trap found and whether it is illegal / what to do with an injured animal, you can give us a ring on 07891 639803 and we can try to help! 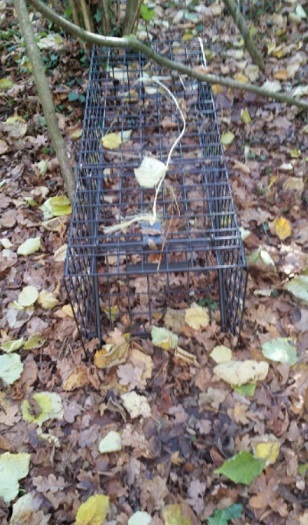 Please note that badger traps used for vaccination programs should be labelled with details of who is carrying out the vaccination and some kind of identification number of the trap found plus contact details. All traps should be placed somewhere with an amount of shelter from the elements. Call us / GBO if you find an unlabelled badger cage, especially if not in a cull zone, or outside of cull periods.